The City of Richmond, in partnership with Richmond Public Schools (RPS) and the Richmond Public Schools Education Foundation, highlighted the poverty reduction initiative RVA Future Centers today at the Armstrong High School Future Center. RVA Future Centers have launched in all five comprehensive city high schools this semester. Future Centers are dedicated classroom spaces within each school building that are resource hubs for connecting high school students and their families to college and career planning resources. Each Future Center is staffed by a full-time site coordinator, who develops and implements a school-specific plan to engage all students in developing a personal plan for life after high school, starting in their ninth grade year. Future Center staff work closely with RPS guidance staff and community organizations providing college and career planning assistance such as GRASP. RVA Future Centers are the result of recommendations made by the Promise Scholarship Task Force assembled by the Mayor’s Office of Community Wealth Building, which included representatives from RPS, RPS Education Foundation, all four local colleges and universities, the State Council of Higher Education for Virginia, and other stakeholders. The City’s FY2015-16 budget provides $425,000 to the RPS Education Foundation to start the program. Additional support from private funders, including AT&T, Altria, Capital One, and the Mary Morton Parsons Foundation, has allowed the program to open in all five schools this year. “We are appreciative of the support and energy both the City of Richmond and RPS have invested to make this terrific program a reality in a very short period of time,” stated Brendan McCormick, chair of the Richmond Public Schools Education Foundation. RVA Future Centers will function both as a bold anti-poverty initiative and as a supplement to the academic improvement plan of Richmond Public Schools, which has set targets for increasing the proportion of its graduates going on to enroll in post-secondary education. 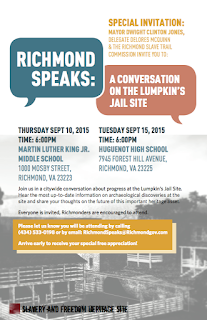 In September of 2015, the City of Richmond launched a community conversation about the future of the Lumpkin’s Jail site. Spearheaded by Mayor Dwight C. Jones and the Richmond City Council Slave Trail Commission, the public conversation has reached more than 1,000 individuals through public meetings, classroom visits, in-person engagements, social media and direct outreach. Additional public meetings are upcoming as the discussion continues. However, a preliminary report is now available detailing the work of the consultant team thus far, and sharing preliminary information that the process has yielded. Generally, Richmonders want the site to be expansive, to include as much of any other significant vestiges of Richmond’s history as possible. They want the site to be a place that brings community together, where issues of race can be addressed and dialogue can be ongoing while education and scholarship are hallmarks. The site also must be accessible and sustainable. Upcoming meetings will give participants the opportunity to vote on priorities and recommend next steps. The next public meeting is Dec. 10 at the University of Richmond in the Jepson Alumni Center at 6 p.m. Plans are also underway to present the report to the Virginia State Legislature in January; a key source of funding for the project’s advancement. To view the draft report, please visit www.richmondspeaksaboutlumpkins.org. On November 17, 2015, the City of Richmond successfully issued $85.8 million of taxable and tax-exempt series of bonds, which were sold by competitive bid. Seven bids were received for the $62.8 million Series 2015B bonds, with Bank of America Merrill Lynch winning the bid. Seven bids were also received for the $23.0 million Series 2015C bonds, with Robert W. Baird & Co., Inc., winning the bid. Reporting before the Finance and Economic Development Standing Committee today, the City noted that investor demand for the City’s bonds was considerable and that the bonds sold with a lower than expected interest rate, saving money for the city. The City received an interest rate of 3.83% on its taxable bond issuance, over 1.25% lower than initial planning rates. The longer term tax-exempt series received a 3.16% interest rate. The bonds sold will be used to finance spending related to general capital improvements for Stone Brewery as well general capital improvements in the City’s Capital Improvement Plan. “These lower-than-expected rates are a benefit of the City’s strong credit rating, and sound management that has protected that rating,” stated Mayor Dwight C. Jones. All three of the national credit agencies, Moody’s Investor Service, Fitch Ratings, and Standard & Poor’s, rate Richmond’s bonds Aa2, AA+ and AA+, respectively, with a Stable outlook, which is considered “very strong”. The City’s ratings are either one or two notches away from “AAA”, the highest possible credit rating. This fact, coupled with near historic low interest rates, provided the City the opportunity to achieve these excellent results. The City of Richmond has announced plans to move forward with improvements to the Intermediate Terminal/Intermediate Wharf – a City-owned parcel that fronts the James River on the East side of the city. Providing increased public access to the riverfront is one of the goals in the City’s adopted Riverfront Plan. Improvements to the Intermediate Terminal Dock are seen as especially timely with the completion of the Virginia Capital Trail – 52 miles of continuous multipurpose trail between Williamsburg and Richmond. A structural stabilization project has been underway in the Intermediate Terminal area since August of this year. With the completion of that stabilization nearing in early Spring of 2016, the City is ready to move forward with broader plans for improving riverfront access in that area, to include passive and active Riverfront recreational opportunities. Conceptual plans for the development of the area include the possibility of a community pavilion, an event lawn, an interpretive tidal pool, a fishing area, or maybe even swings. An exploration of what the public would like to see created in that area will be undertaken with a planned public meeting process. Local civil engineering and design firm, Timmons Group, has been contracted to develop conceptual plans for the Intermediate Terminal. They will be holding public meetings beginning in mid-January 2016 to discuss project concepts and design recommendations. 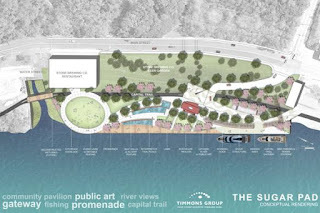 The Richmond Riverfront Plan emphasizes the importance of the riverfront as a singular destination and attraction unique to Richmond which can catalyze growth for the whole city and in specific areas. The plan provides for phased riverfront improvements to reinvigorate existing public spaces and establish new public landscapes of varying character, program and scale. Along the east riverfront, other progress has been seen with the demolition of the Lehigh Cement silos and installation of the Low-Line project with CSX and Capital Trees. In other riverfront news, the City has also recently announced plans for Port of Richmond improvements and began construction on the T. Tyler Potterfield Memorial Bridge. The Richmond Public Library, the Office of Community Wealth Building and Richmond Public Schools (RPS) have partnered to create RVA Reads to improve literacy in the city by improving access to books in low income homes of preschool children. RVA Reads is designed to expand or create home libraries for three and four year olds, increase the time parents and children read together and engage children and families in library services. The program provides one book a month to hundreds of pre-k children participating in the Virginia Preschool Initiative. To introduce the books each month, community volunteers visit pre-k classrooms to lead fun, interactive readings with the students. These readings take place at the RPS preschool centers at Blackwell, Maymont and Mary Scott schools as well as the Martin Luther King, Jr. Preschool Learning Center. Members of the City Administration and parent volunteers will lead the next reading event at the Martin Luther King, Jr. Preschool Learning Center on Tuesday, Nov. 17 at 9:30 a.m.
RVA Reads began as a pilot program in 2015. As a result of the program’s success, Mayor Dwight C. Jones designated funding in the FY16 budget to continue the program. The first books included in the program were The Snowy Day by Ezra Jack Keats, The Carrot Seed by Ruth Krauss, Caps for Sale by Esphyr Slobodkina, and Pete the Rocking Cat in my School Shoes by Erik Litwin. The December selection is a bilingual book by Alice and Martin Provensen entitled El Libro de las Estaciones / Book of Seasons. “As we celebrate Veteran's Day, it is important that we reflect upon what these brave men and women have selflessly done. We thank all of our veterans and active duty military personnel for the sacrifices they have made and continue to make to help keep our country safe. I would also like to recognize all the City employees and their families who have served, both past and present. “Veterans of the U.S. Armed Forces have given so much to ensure that we are able to continue to enjoy our rights and freedoms. Today, be sure to properly honor the debt we owe to them all. Construction of the City’s first “Bike Boulevard” will begin on November 16. The Bike Boulevard is being installed along a 2-mile stretch of Floyd Avenue from North Thompson Street to North Laurel Street. This capital improvement project represents an estimated investment of $900,000, with the majority of funding coming from Federal funding sources. Final plans for the Floyd Avenue bike boulevard followed extensive community meetings and input. The enhancements will improve vehicular and pedestrian interaction through slower operating speeds for motorists and shorter crossing distances for pedestrians. To minimize the impact on businesses and residents during construction there will be no complete street closures. On occasion, there will be single lane closures. As the project advances, residents and motorists are encouraged to adhere to signage in the work zones. The City’s Bike Master Plan, released in May of this year, has identified several other corridors which would benefit from bike boulevards - such as North 29th Street in Church Hill and Allen Street in the Fan and Randolph communities. Funds are being sought to pursue these projects in the future. The 2015 UCI Road World Championships Sustainability Report to be released next week by Mayor Dwight C. Jones shows that the event achieved or exceeded all of its sustainability goals. A goal was set to divert a minimum of 60% of event waste from going to the landfill, and the efforts undertaken surpassed that goal, achieving a 76% waste diversion rate. Waste diversion was achieved by composting food wastes; requiring caterers and vendors to use compostable serve ware; operating a robust recycling effort that included cardboard, pallets, and plastic bags, reusing event signage, recovering and donating unused food, collecting cooking grease to turn into bio-fuel, using water filling stations and reusable beer cups in lieu of plastic. An additional goal of offsetting 100% of the greenhouse gas emissions produced from event operations was met. Sources of emissions included electricity use in the Greater Richmond Convention Center, fuel use for generators and equipment; propane and cooking fuel for vendors and caterers; and fuel use for official event vehicles, shuttle buses, refuse, recycling and compost haulers. The 100% offset was attained via Renewable Energy Certificates (RECs) provided by the City of Richmond Sustainability Office through its participation in the Dominion Green Power Program. Dominion Green Power RECs come from wind, solar and biomass facilities in the mid-Atlantic and Southeastern regions. The 2015 UCI Road World Championships was the first Road World Championships ever to receive the official UCI reCycling eco-label. The eco-label recognizes environmentally responsible cycling events that submit an Environmental Management Plan documenting intended actions to address transportation, energy and water conservation, recycling and waste management, accommodations, catering and supplies. The event was certified as a Virginia Green Travel Event. The Virginia Green Program is Virginia’s self-certifying program to encourage green practices in all aspects of its tourism industry including festivals and sporting events. The program is run through the Virginia Department of Environmental Quality, the Virginia Tourism Corporation, and the Virginia Hospitality & Travel Association. The Worlds is in the process of obtaining the Council for Responsible Sport event certification which is based on the event’s actual performance in key areas of equity, access, community impact, and legacy. As a result of the sustainability achievements for the Worlds, the City of Richmond and the Virginia Green Travel Alliance are developing a Green Event Toolkit to share lessons learned and provide free resources to enhance the sustainability of future events. “The Worlds was an opportunity for the Virginia Green Travel Alliance to help showcase how green an event can actually be when the proper planning takes place and adequate resources are made available,” said Tom Griffin, Executive Director of the Virginia Green Travel Alliance. “The Sustainability accomplishments of the Worlds have set a new standard for events and festivals in the community and the Green Event Toolkit will help organizers meet this new standard. All three Wall Street bond rating agencies have re-affirmed their rating of general obligation bonds to be issued by the City of Richmond. The re-affirmations follow six bond rating increases the city has received since Mayor Dwight C. Jones took office in 2009. • “Very strong management, with ‘strong’ financial policies and practices under our Financial Management Assessment methodology. • “Very strong liquidity, with total government available cash of 33.1% of total governmental fund expenditures and 3.7x governmental debt services, and access to external liquidity we consider exceptional. Mayor Jones, city administrators, and the city’s financial advisors hosted the three bond rating agencies in Richmond in mid-October, in preparation for a scheduled issuance of bonds through competitive sale on November 12. The bonds will be used for school projects, general capital improvement projects throughout the city, and costs related to Stone Brewing’s investment in the Fulton neighborhood. The costs of the Stone project will be covered by the firm’s rent payments for the factory under construction in Richmond’s East End. In addition to the re-affirmations, the agencies also noted the city’s need to continue funding annual required pension contributions, the need to continue addressing Richmond’s poverty rate, and the need to return to timely financial reporting. The agencies also noted that the possibility of using budget reserves could lead to a lowered bond rating in the future. Click here to view the letters from all three rating agencies. 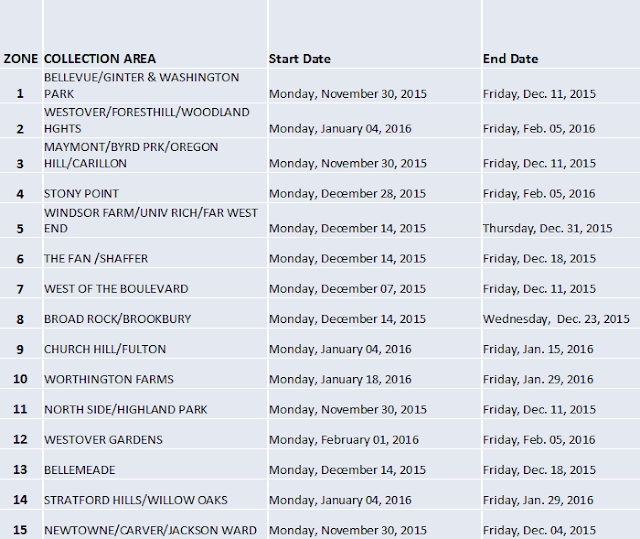 The City of Richmond today released its annual leaf collection program schedule, which is set to begin Monday, Nov. 30. The Department of Public Works will conduct one 10-week cycle to vacuum leaves throughout the entire city. In addition, the department will collect bagged leaves on a continual basis. 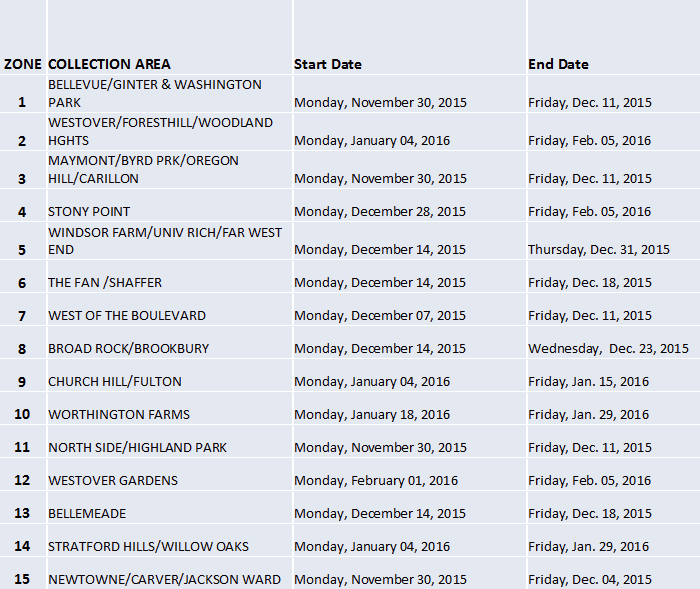 In previous years, Public Works conducted two vacuum collection cycles that often lasted as long as 22 weeks. Following budget reductions approved earlier this year, City officials initially were faced with either eliminating vacuum leaf collections in many neighborhoods, or seeking additional funding. Mayor Jones asked that an alternative be identified that would maintain leaf collection services for the entire City, while doing so more efficiently. The Department of Public Works reminds residents to rake leaves to the property line that is adjacent to the street prior to their scheduled vacuum collection date. Leaves and other debris should never be raked or placed into the street or culvert. Dirt, rocks, metal or branches should be removed from leaf piles, as this will prevent City crews from collecting the piles. Residents who bag leaves should use biodegradable lawn or leaf bags, as they can be recycled with the leaves. During a neighborhood’s vacuum collection dates, City crews will pick up an unlimited number of bagged leaves per household. At other times and on a continuous basis, up to 25 bags of leaves will be picked up on the same days as trash collection. City residents may also dispose of leaves by taking them to several locations: East Richmond Road Convenience Center at 3800 East Richmond Road; Maury Street Landfill at 2900 Maury Street; and the “Powerline” at 8600 Huguenot Road at the northwest corner of Chippenham Parkway. The above schedule may change as a result of inclement weather. The vacuum leaf schedule and information about other city services are available at www.Richmondgov.com. The schedule is also available by calling the leaf hotline at (804) 646-LEAF (5323). Construction will begin on Friday, October 9 on a major transportation project designed to improve traffic safety at the intersections of Monument Avenue and Allen Avenue by converting the existing traffic circle into a modern roundabout. The work is expected to last through early January 2016. The scope of the work at the four legs, or intersections, leading into the current circle includes the installation of medians and corner island extensions, concrete sidewalks, ADA compliant curb ramps, pedestrian crosswalks, signage, pavement markings and landscaping. The improvements will create an easier and safer means for motorists to travel through and pedestrians to cross the intersecting roads. Those driving through the area may experience occasional single lane closures. Allen Avenue may be closed at times during construction, however proper work zone signage will be provided throughout the project construction. The total project cost is estimated at $550,000, with half being paid through VDOT Revenue Sharing. There are currently seven roundabouts in the City and approximately four others either under construction or in the planning stage. For more information on City projects and services, visit www.RichmondGov.com. The Administration of Mayor Dwight C. Jones today announced that Deputy Chief John J. Buturla will serve as the Interim Deputy Chief Administrative Officer (DCAO) for Operations, effective October, 14, 2015. Buturla will be filling the position being vacated by Christopher Beschler following his appointment to a state position which was announced last month. The DCAO for Operations has the management and oversight responsibility for the Department of Public Works, Department of Public Utilities and Animal Care and Control. Buturla, who at one time served as a Chief Administrative Officer for the City of New Haven, Connecticut, is seen as having the management experience and knowledge necessary to lead the operations portfolio. Mayor Dwight C. Jones recently tapped Buturla as the lead coordinator for the execution of the City’s logistics responsibility in hosting the UCI Road World Championships (Worlds). The success of the Worlds was in part attributed to his leadership. “I am confident that John will be a welcomed addition to our executive team,” said CAO Selena Cuffee-Glenn. Today, the City of Richmond presented the completed 2014 CAFR (Comprehensive Annual Financial Report) to the Richmond City Council’s Organizational Development Committee. This completes the process for the outstanding 2014 report and allows the City to move forward with preparations for the 2015 CAFR. To read the 2014 CAFR, click here. Mayor Dwight C. Jones thanked workers and the community following the conclusion of the 2015 UCI Road World Championships. The nine-day event is estimated to have exceeded anticipated attendance with approximately 645,000 onsite spectators over the entirety of the event, including the Opening Ceremony. After two years of public engagement, planning and environmental permitting, the much loved Brown’s Island Dam Walk is on track to reopen to pedestrians. The new T. Tyler Potterfield Memorial Bridge will provide an access point to one of the most beautiful sections of the James River and the first bicycle and pedestrian-only crossing of the river. Howard Shockey & Sons, Inc. will start construction this fall, and is expected to finish the bridge by August 2016. Once complete, the pedestrian walkway will infuse a new energy into the entire riverfront area. “This month’s groundbreaking will mark the culmination of nearly a decade of planning and visioning by the City of Richmond and Shockey is excited to get underway on the project,” says Jeff Boehm, President of Howard Shockey & Sons, Inc. Previously known as the Brown’s Island Dam Walk, the new T. Tyler Potterfield Bridge will transform sections of old dam infrastructure into a new pedestrian and bicycle walk path. The new structure will utilize as much of the existing, historic structure as possible and will be supplemented with new decking, decorative railings, and structural provisions to improve safety. Work on the South Bank will connect to the Floodwall Walk, Manchester neighborhood, and the climbing wall. The total length of the bridge is 1,600 linear feet, approximately one-third of a mile. The completed work will provide a safe deck on which users can walk, run, ride a bike, push strollers, and even travel in a wheelchair across the river. Among the planned improvements to the existing structure is an expansion of the “Three Days in April” overlook, which memorializes a significant point in Richmond’s history when- during three days in April 1865 - the city fell to the Union Army after four years of civil war. In addition, three new overlooks with interpretive content will be added to the bridge as part of the redevelopment project. In June 2015, Shockey was awarded the contract to serve as construction manager at risk for the project. In this role, Shockey is responsible for implementation of the contract including daily oversight of all construction activities and subcontractor management. Earlier, the City of Richmond tapped AECOM to manage comprehensive redevelopment efforts. The landscape firm of Hargreaves Associates rounds out the team of professionals tasked with the design of the project. 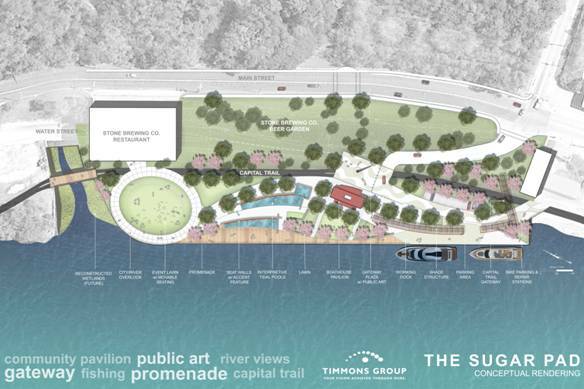 “The Richmond Riverfront redevelopment is an especially rewarding project for our team. We believe it is a transformative project that will positively impact the city and all its residents,” says Jennifer Macks, VP at Shockey. “The bridge will be a defining recreational landmark within the revitalized riverfront area,” said Macks, who noted there are several challenges that could impact the construction schedule, most notably the moratorium on working in the James River from mid-February to the end of June. A series of precautions will be implemented to protect the river and associated wildlife during construction. The project also entails extensive replanting of the embankment area to encourage enhanced wildlife habitats. More than 1,000 native ferns, shrubs and trees will be planted as part of the project. Shockey’s Richmond office is located at 1805 E. Grace Street in Richmond’s historic Shockoe Bottom area. Over the past 10 years, Shockey established its presence in the Richmond area with high-visibility projects such as GRTC’s award-winning headquarters on Belt Boulevard, the new Martin Luther King, Jr. Middle School on Mosby Street, and a downtown data center upgrade for VCU. The City of Richmond was presented with a 2015 Governor’s Technology Award during the annual Commonwealth of Virginia IT Symposium held in Richmond. The City's Open Data Portal won the award in the category of Innovative Use of Open Data. The City’s Open Data Portal was launched on July 1 as an online publication of government datasets in a computer consumable format. Initial datasets include a Check Registry; GIS maps of fire districts, parks, trails, enterprise zones, public schools by elementary, middle and high schools, building parcels, and more; public safety Information; and public works data for trash collection zones, recycling, and street cleaning. For a full detail of all the award winners, visit www.covits.virginia.gov/winners.html. Motorists can expect smoother traffic flow next week in the area of the 5th Street and the 7th Street bridges over Leigh Street. The rehabilitated 5th Street Bridge will open Monday morning. The 7th Street Bridge re-opened in June. Both bridges were closed earlier this year when the $3.6 million dollar refurbishment began. The Leigh Street corridor between 5th and 7th streets, which closed during construction, also re-opens on Monday. In Shockoe Bottom, the two-way traffic conversion of 17th Street between East Broad and Grace streets will open to traffic on Monday. The traffic pattern change is one of several improvements included in the $614,000 project funded by the Virginia Department of Transportation’s Highway Safety Improvement Program under the 2005 Safe, Accountable, Flexible and Efficient Transportation Equity Act. The 19th Street two-way conversion also includes back-in angle parking to aid in increasing parking spaces in the area. Franklin Street between 18th and 19th streets has also been uncovered and restored to a cobblestone surface. The Southern Regional Office of AmeriCorps National Civilian Community Corps (NCCC) selected the City of Richmond and HandsOn Greater Richmond, Lewis Ginter Botanical Garden, Groundwork RVA, and Virginia Green Travel Alliance to receive an AmeriCorps NCCC Team this Fall. The Southern Regional Office received 50 applications and awarded only 20 teams. NCCC is a full-time, team-based residential national service program for young adults who want to give back to communities in need at different locations across the country. There are currently more than 50,000 members serving in AmeriCorps NCCC. “Being selected as a recipient of an AmeriCorps NCCC team recognizes the importance the City places on volunteerism as a way to engage young people in the work of City government and improving the community,” said Mayor Dwight C. Jones. The Richmond NCCC team will have five to nine members and work in Richmond from September 17 through November 11, 2015. The team will support the City’s RVAgreen sustainability initiative by serving as Green Team leaders for the 2015 UCI Road World Championships and the 2015 Richmond Folk Festival to enhance recycling, composting and other sustainable event practices. They will also complete several community-based urban greening projects including removal of invasive species, trail erosion diversion and building an outdoor living classroom. The team will be housed at Second Presbyterian Church and Pocahontas State Park. In a national survey of small businesses conducted by the website Thumbtack, the Richmond region ranked third in Business-friendly Cities. The survey included rankings in 11 different categories including; overall friendliness; ease of starting a business; ease of hiring; regulations; health and safety; employment, labor and hiring; tax code; licensing; environmental; zoning; and training and networking programs. The region received A+ ratings in nine of the 11 categories. Richmond has been included in the survey since 2013 and the category ratings have improved greatly over the past two years. The first and second ranked cities are Manchester, N.H. and Dallas, TX respectively. The City of Richmond and CultureWorks are pleased to announce a special cycle of the Arts and Cultural District Micro Grant Program. Arts and Cultural District Micro Grants provide funding assistance to district non-profits, small businesses and galleries located to reach visitors in the area during the 2015 UCI World Road Cycling Championships and major music and food festivals occurring between September 1 and November 1, 2015. Grants up to $1,000 are available to support arts related events, installations or programs in the Arts and Cultural District. Partnerships between entities located inside and outside the District are encouraged. Previous recipients of an Arts and Cultural District Micro Grant are eligible and encouraged to apply for this special cycle. Applications will be accepted and reviewed on a rolling basis. Awards will be based upon creativity in design and approach, coinciding with major events occurring in/near to the District during the grant period, and need. The application and full list of requirements are available at www.richmondcultureworks.org/services or contact Caron Sterling at CultureWorks, caron@richmondcultureworks.org or (804) 340.5280, ext. 1. The City of Richmond and CultureWorks continue to collaborate with businesses, galleries, non-profits and artists to foster a vibrant arts community that generates enjoyment and civic pride for residents, stimulates the local economy, and develops an appreciation for diverse cultures and art forms. Demolition crews will begin removing the pedestrian bridge connecting Kanawha Plaza to Dominion Plaza starting at 6 p.m. tonight. That’s when Canal Street will be closed between 7th and 8th Streets, and removal of the bridge will begin between 7 p.m. and 11 p.m. Drivers on 8th Street will still be able to turn left onto the Manchester Bridge. Removal is expected to be completed by late Sunday. Prior to removing the bridge, preparatory work will include installing protective measures to prevent pedestrian access during demolition. Once the road is closed, crews will mobilize equipment, install shoring to support the bridge, and place protection on the road and sidewalks beneath it. The first step is for a crane to break the north end of the bridge free, where the bridge ties into Dominion Plaza. Then the rest of the bridge will be removed using a CAT excavator. All debris will be hauled away and disposed of at the Cox Recycling Center. After the bridge is down, all materials will be removed and the road will be cleaned in time for Monday morning traffic. The removal comes one week after Mayor Dwight C. Jones kicked off renovation of the 2.8 acre urban park located downtown on two city blocks surrounded by office towers. Over the past week, demolition crews have removed exterior walls that hampered sight lines across the park, have graded the site, and have preserved personalized bricks for reuse in the renovated park. A public/private partnership allows for the restoration of this under-utilized downtown jewel and equally important to the long-term success of the park is improving access from neighboring streets. The renovation includes the retention and repair of the plaza’s fountain, large green space and landscaping improvements, canopies and a food truck area. Richmond 2015, in conjunction with officials from the City of Richmond and Henrico and Hanover counties met Wednesday, August 5, 2015 to brief the media on the comprehensive Transportation Plan and interactive navigation website for the 2015 UCI Road World Championships. They discussed race schedules, traffic management strategies, navigating around town during the event, parking, shuttles, and emergency information. Visit http://navigate.richmond2015.com/ for more information on these topics for the 2015 UCI Road World Championships that will take place September 19 - 27, 2015. The City’s Department of Public Works has completed work on a new roundabout at the intersection of 25th Street, Nine Mile Road and Fairmont in Churchill. Plans for the roundabout were part of the corridor improvements presented in the East End Transformation Plan. Mayor Dwight C. Jones and Richmond City Councilwoman Cynthia Newbille, East End 7th Voter District, will announce the opening of the roundabout at National Night Out festivities in Churchill tonight. The roundabout will open to traffic on August 5, 2015. The intersection will no longer be controlled by traffic signals; instead, the new roundabout provides a circular intersection with yield control for entering traffic, splitter islands on the approaches, and appropriate roadway curvature to reduce vehicle speeds. Minor work will continue to include ornamental and overhead street lighting installation. The City constructed this project using Federal Highway Safety Improvement Program funds and the total cost of the project was $1,100,000.